Through my own exploration over the past seventeen years, I have located areas only seen by the more adventurous hiker and fisherman. In fact, I may have been the first to view many of the states hidden gems through a camera lens. This article explores some of my favorite locations for landscape photography that the mountain state has to offer. 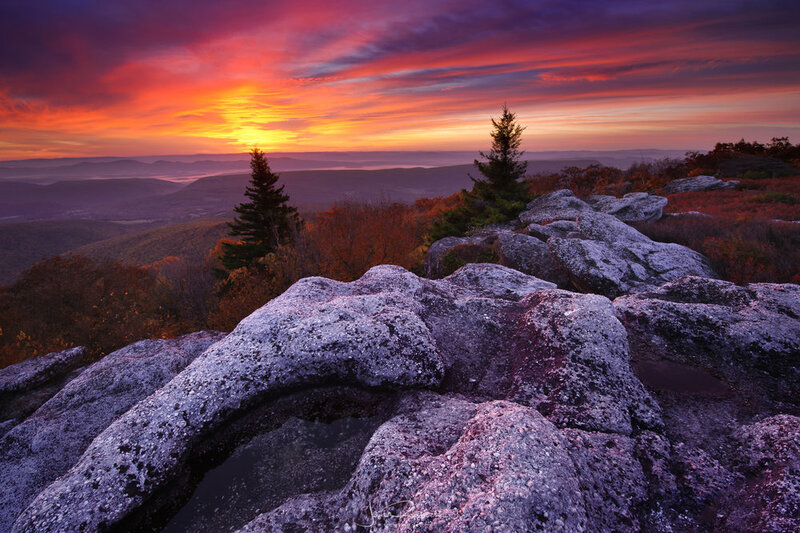 Bear Rocks Preserve at the north end of the Dolly Sods Wilderness offers some of the most breathtaking scenery in all of the East Coast. In my opinion, there are no overlooks in all of Appalachia as dramatic as those on Bear Rocks Preserve. The mix of sculpted sandstone rocks, cliffs, heath barrens speckled with stunted spruce, and a sea of mountains rolling off to the east make this location a must visit for any serious nature photographer. Bear Rocks sits at nearly 4,000 feet and the landscape consists of wind-swept heath barrens, rocky out crops, and stunted spruce forests. Sunrise and sunset are both excellent for capturing dramatic landscape images of the sweeping terrain, but the location can be photographed at almost any time of the day. It is a bit of a drive from the nearest lodging in Canaan Valley, so if you intend on being on location for sunrise, you will need to leave at least two hours before dawn. On the flip side, if you shoot sunset don’t plan on not getting down to your base camp until well after dark. I prefer to camp up top which allows me to focus more time and energy on getting the shots as opposed to driving in the car. Red Creek Campground offers campsites and bathroom facilities (although very primitive) on top of the mountain just a short distance from Bear Rocks. Keep in mind that there are far more photographic opportunities that await the adventurous photographer in the back country of the wilderness. In particular, a hike on the Rohrbaugh Trail allows incredible vistas looking down Red Creek at sunset. Even deeper in the wilderness is Red Creek, which cuts a deep canyon filled with mature second growth forests, and many cascades and waterfalls along its decent. In the southern section of the wilderness, lies the remote and much less visited Roaring Plains unit. 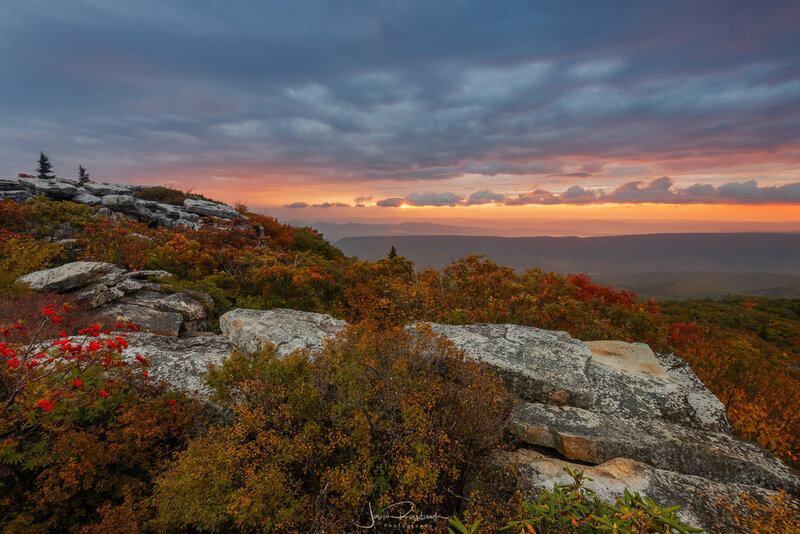 Although the views are not quite as extensive as the Bear Rocks area, the solitude alone makes it a great trip for any shooter looking to get off the beaten path and explore some more unique views of Dolly Sods. This amazing state park just outside of Davis, West Virginia offers up some of the best waterfall photography on the East Coast. In addition to the amazing amount of waterfalls in the park, you will also find wild canyon vistas and rocky outcrops. Wildlife is also abundant and due to the popularity of the park easily approached and photographed. It is not uncommon to see deer, black bears and wild turkeys all in a single day. Any season will produce amazing results in this park, but if I had to choose just two times of the year to photograph it would be in the spring and fall. In fact, the fall color in West Virginia rivals, and in my humble opinion, beats the color parade of New England. Your best bet will be the first and second weeks of October. But keep in mind, the higher elevations like Dolly Sods and Spruce Knob can sometimes turn color as early as the last week of September. While in the park, be sure to visit Elakala Falls—a series of waterfalls on Shays Run just a short hike from the lodge. Anyone can easily make it to the first and second falls on Shays Run, but only the more adventurous and seasoned hikers will be able to access the waterfalls deeper in the canyon. I have photographed all four of the falls, and believe me, it is a difficult bushwhack down from the second falls. Please use extreme caution and don’t go it alone if you decide to explore further. While in the park, set aside your sunrises and sunsets to explore both Lindy Point and Pendleton Point for amazing canyon vistas. The namesake of the park, Blackwater Falls, a 62 foot waterfall sitting at the start of the canyon, is easily photographed from either the Gentle Trail or the Boardwalk Trail (which descends to a platform at the waterfalls base) early in the morning or late in the afternoon. Sitting in the heart of the Monongahela National Forest and only a short drive from the Canaan Valley, Dolly Sods, and Blackwater Falls State Park, is the Spruce Knob/Seneca Rocks National Recreation Area and the National Forest that surrounds it. Spruce Knob, the tallest peak in the state at 4,863 feet offer incredible panoramic vistas at both sunrise and sunset of the surrounding mountains and forests. Seneca Rocks’ razor like fins jut out of the Potomac Valley, offering world class climbing and photography. You can shoot the razor back fins from below or climb the trail to the top for unique views from above. Sunset is the best time to shoot this location. While in the area, don’t pass up a chance to explore the expansive Monongahela National Forest with trails to some of the most pristine streams in the country as well as bounty of forest scenes, lonely mountain tops, and abundant wildlife. In conclusion, if you are a serious nature and landscape photographer, this little known and less photographed area of the world should be added to your list. Trust me; you will fall in love with this place just as I did over twelve years ago. Good luck and best of light!